The summer turned out quite nice in the end here in Bristol. But perhaps I’m biased because August ends with mine and Tim’s anniversary. This year we celebrated 14 years. That’s two-fifths of my life! My reading has been fairly eclectic this month. I took more than two weeks to read a perfectly ordinary short novel so then I turned to easy reads like superhero comics. I think I’m back on track now, but I did only manage one book towards Women in Translation Month in the end, which isn’t as good as I’d hoped. Not 10 years of the blog; I’m not that with it! No, this week Tim and I celebrated 10 years together with a holiday in Cambridge. I’d not been before, though I felt like I knew it well from books, films and TV, but it was a real treat to go and soak up the centuries of learning. So much great architecture, culture, science and art. Far too much for a week in fact! At least, it is when you take frequent breaks for pleasant walks, reading books and eating delicious food. 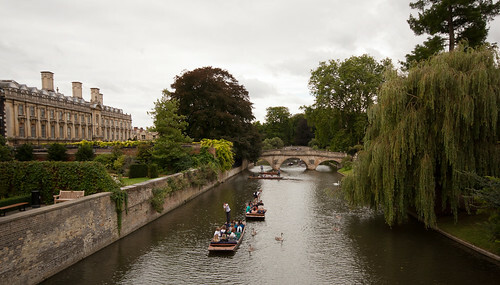 The classic view of the River Cam, complete with punts and bridges, and I think that’s the back of King’s College. 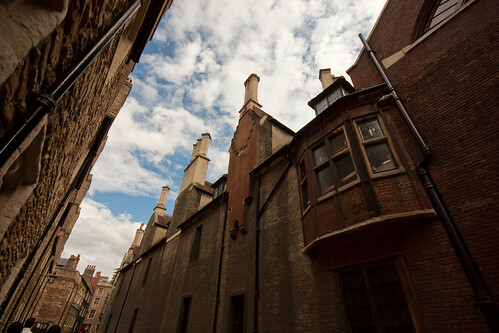 Plenty of narrow cobbled streets and a little less plenty of sunshine. 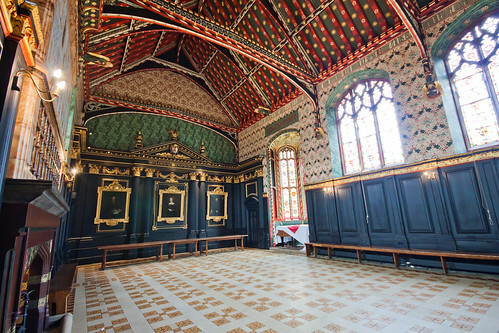 Some seriously impressive architecture and interior décor at these colleges, for instance this hall at Queens’ College. Plus lots of bookshops, lots of green spaces and bikes everywhere (though not that many actually being ridden while we were there; not sure if that’s because it’s outside of term time or because my expectations were skewed by living in the Cycling City that is Bristol). I took approximately a bajillion photos, a lot of which were on film, so my Flickr photo set will grow, if you’re interested.